The Shackleton is powered by four Rolls-Royce Griffon piston engines, the same engine that powered the later Spitfire's. This Shackleton was delivered to 201 Sqn on March 1 1959 and made it's last flight to the Duxford air museum in 1972. Additional information about the Avro Shackleton MR3 Graphic: The Shackleton first flew in 1949 and continued in sevice until the 1990's. The Shackleton airframe is evolved from the Avro Lancaster. Siteseen Ltd. are the sole copyright holders of this Avro Shackleton MR3 picture, unless otherwise stated. We only authorise non-commercial picture use and particularly encourage their use for educational purposes. 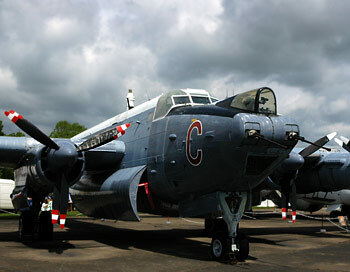 This Avro Shackleton MR3 picture is not in the Public Domain. 3) Use of this Avro Shackleton MR3 picture, or any of our pictures on websites re-distributing copyright free material is strictly prohibited.